At the 14th International Conference of the Society for Integrative Oncology, a new definition of integrative oncology was announced. Integrative oncology is a patient-centered, evidence-informed field of cancer care that utilizes mind and body practices, natural products, and/or lifestyle modifications from different traditions alongside conventional cancer treatments. Integrative oncology aims to optimize health, quality of life, and clinical outcomes across the cancer care continuum and to empower people to prevent cancer and become active participants before, during, and beyond cancer treatment. Integrative oncology seems to be firmly rooted in the true philosophy of "integrative health care". I am looking forward to watching it grow strong for the health of patients and their families and the field of health care in general. To learn more about this year's conference, I recommend reading the report by Zeyiad Elias, DAOM, RAc, in the winter 2018 issue of Meridians: Journal of Acupuncture and Oriental Medicine. Elias Z. Society for Integrative Oncology 14th International Conference: A Report. MJAOM 2018;5(1): 30-35. If you found this information helpful, please consider contributing $5 or $25 at our website to help with creating this blog resource and building new resources for the community. Thank you. Did you know, that, for the first time in our profession, we have a unique Standard Occupational Code (SOC), published and being tracked by the Bureau of Labor and Statistics since Jan. 1st, 2018? This is a major milestone for our profession. Two other major milestones for hospital-practice Acupuncturists have occurred within just 40 days of this. The Joint Commission Pain Management Standard began official implementation Jan. 1st, 2018 for any accredited facility (most U.S. hospitals strive for accreditation by the Joint Commission). This includes requiring facilities to provide non-pharmacological pain management therapies (such as acupuncture/East Asian medicine, chiropractic, yoga, physical therapy, health psychology) by qualified, licensed practitioners. 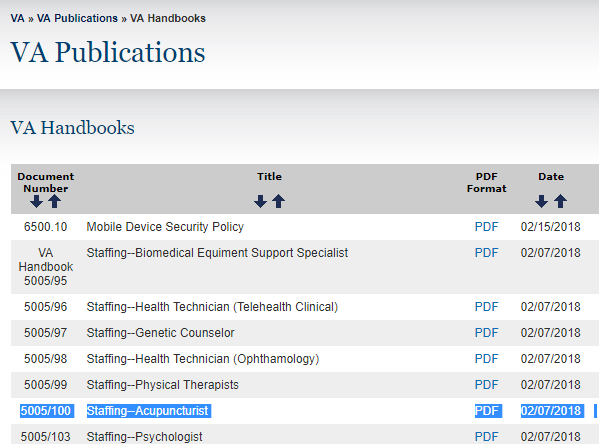 The VA Occupation/Staffing Handbook was updated February 7th, 2018 to include a professional occupation distinction, Acupuncturist. So, how does having a standard occupational code (SOC) make a difference? Makes it easier for health care organizations to create job descriptions and credentialing packets for your occupation. 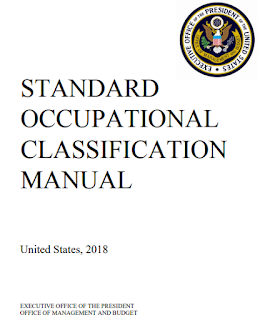 So, if you are the first or one of the first people in your profession to work in that health care facility, civilian OR federal, the facility now has this basic standard that they are accustomed to reference, the BLS SOC Handbook, to write the basic outline for the job (position) description and the outline for your credentialing packet. Hospital Credentialing Office: What is the occupational code for your profession? Me, as a volunteer in the early 2000s: I don't know. Let me find out. Calling my mentors and national organizations: What is our occupational code? Someone in the NCCAOM® office: Actually, we are working on it. Me: Cool. What does that mean? Me, to the Credentialing office in the early 2000s: My profession does not have a specific BLS federal occupational code at this time. Here are some related standards and the current update on the process. Hospital Credentialing Office: [that dreading look of "this means I have to pull together something from scratch"]. Do you have any examples of how Acupuncturists have been credentialed at other facilities? Me, calling the few contacts I had at hospitals: Can you share with my facility a copy of what your credentialing department? Answers: "no, this is proprietary information". "yes, we would love to!" Hospital Sponsor/Credentialing office: What is your occupational code? Hospital Sponsor/Credentialing office: Thank you. Do you have any examples you can share of other facilities' credentialing standards for your profession? "Credentialing of Acupuncturists for Hospital-based Practice: A Resource Guide for NCCAOM® Diplomates". July 2016. "Credentialing Licensed Acupuncture and Oriental Medicine Professionals for Practice in Healthcare Organizations: An Overview and Guidance for Hospital Administrators, Acupuncturists and Educators". October 2016. Where can I find the federal BLS Occupational Code Manual to revel at the code, finally published? You can view a pdf of the 2018 Manual from here. For the published occupational code listing for Acupuncturist, go to p. 107 in the document (114 in the pdf). This Manual has been officially in use since Jan. 1st, 2018. Want to learn more on documenting clinical change in your patient-centered practice? Check out our Metrics series posts: The Pain Scale and Medication Review: Calculating Morphine Equivalent Dose (MEQ). 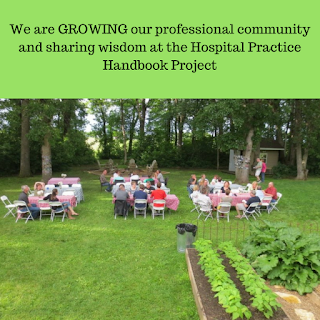 If you have found this blogpost useful, please contribute $5 or $25 today to support the Hospital Practice Handbook Project resource. Follow us on our public Facebook page and sign up for newsletters and announcements through our website. See you there! I have recommended this infographic in previous blogposts on the subject of pain management and the opioid crisis. Moving Beyond Medications is a useful one-page infographic for primary care providers looking for a quick reference point for referrals for non-pharm pain management. In response to the current public health crisis of opioid abuse, overdose, and death, many organizations have issued guidelines and recommendations for treating pain, including the former Surgeon General’s “Turn the Tide” campaign. Similar to other guidelines, this campaign recommends non-pharmacological approaches as first line pain treatment, with opioids to be considered only if these and non-opioid pharmacological treatments are ineffective. This document expands upon those recommendations to help primary care clinicians and their patients with this approach." This infographic, available for free, was created through a collaboration of several national organizations: The Academic Collaborative for Integrative Health (ACIH, the "Collaborative"), the Academic Consortium for Integrative Medicine and Health (the IM Consortium), the Academy of Integrative Health and Medicine (AIHM), and the Integrative Health Policy Consortium (IHPC). The Consortium Pain Task Force published a related white paper, Evidence-based Nonpharmacologic Strategies for Pain Care. Free copies are available for download here. Take our Metrics short courses. The short courses are based on the popular metrics blogposts with downloadable pdfs, examples, and templates. 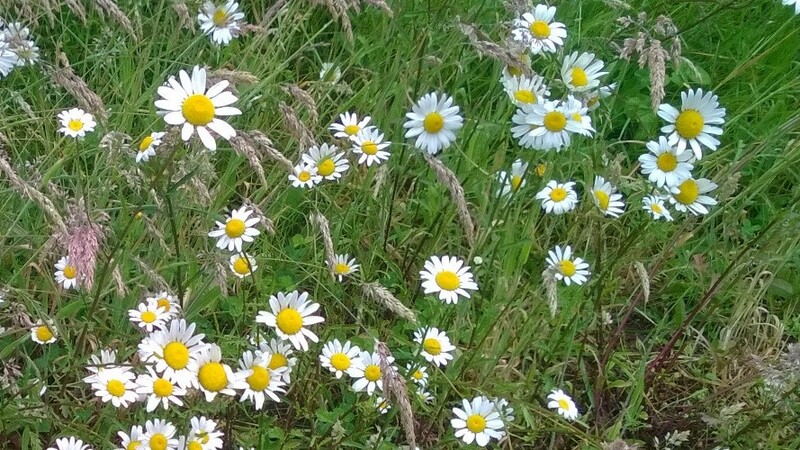 The metrics series blogposts: The Pain Scale and Medication Review: Calculating Morphine Equivalent Dose (MEQ). If you have found this blogpost useful, please consider contributing via the website to help support this resource. Thank you. 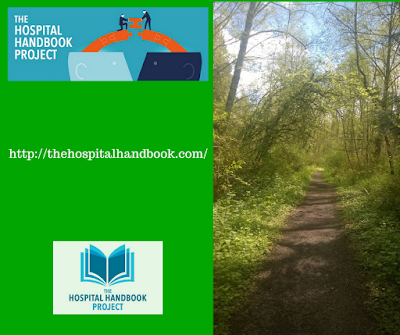 Do you want to follow our work at the Hospital Handbook Project? Just join the contact list on the website, subscribe to the blog, and like our Facebook page. 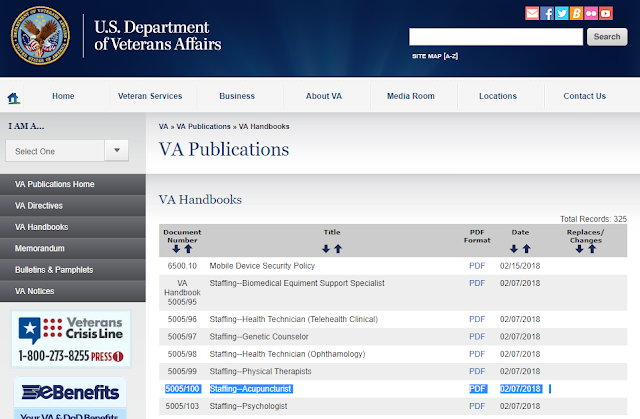 The VA Occupational Code for Licensed Acupuncturists has been published! Thank you to everyone involved in the process who kept doing that next right thing over the past several years to build this code through what must be a tedious process. This occupational code is a huge step toward making this non-drug and non-surgery integrative health resource available to patients as part of their VA care from the local VA clinic to the larger medical centers. From a practitioner perspective, this is big step in the ability to be a full employee instead of temporary contract positions. For more practitioner resources about how to work in hospital practice, connect to our community here and help us build and grow resources for current and future practitioners. We endeavor to fix the silo problem by creating community. Learn more about why I founded the Project here. For hospital administrator resources on how to hire and credential Acupuncturists, there are some basic guidelines here, published by the national organization NCCAOMⓇ and more resources being created through this Hospital-Practice Handbook Project. 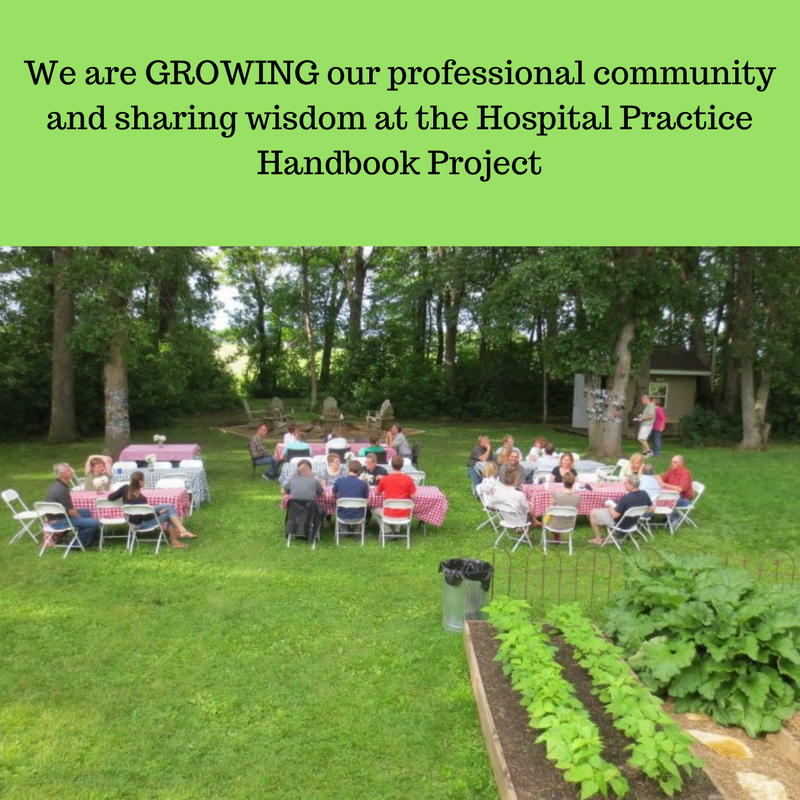 If you are hiring a new practitioner not already connected to the community, please connect them to our contact page and Facebook page where they can connect to other hospital-practice Acupuncturists. 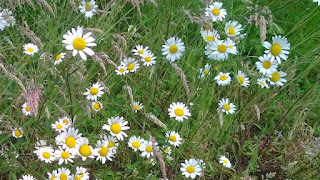 "We connect, share wisdom" to help avoid re-inventing the wheel. For more about why I launched this project, watch this short video. Now for the weblink you have been waiting for! and it brings up a pdf with a note that the pdf or VA Handbook update was published 2.7.2018. Looking at the online pdf, it looks like the positions are title 38 hybrid status and the range of GS-9 (which reads like an internship position) to GS-11 and GS-12 as full-practitioner and GS-13. GS-13 are supervisor or program coordinator positions. It is not clear to me what a full-time researcher position would be, but perhaps that is covered in a different category (the research job category?) of job positions than this. Wonderful news! Thank you to everyone who worked on this effort!! Are you a civilian (non-veteran)? update April 2018: This information is now available as a mini-course, How to Use a Validated Pain Scale in Your Chart Note, in our online school. 100% of proceeds from the course go toward the Hospital-practice Handbook Project. What is a pain scale? However, what is less commonly discussed, is that this scale is not arbitrary. It is a scale that has been validated through research. What does it matter if a scale has been validated through research studies? When a tool is validated through research it means that it has been tested thoroughly and often. Its results are repeatable and can be consistently used to measure change. If you are using a tool in clinical practice, you need it to be consistent so that, when change occurs, you can measure that change. For example, you measure a child’s growth with a height chart. Four cm on a height chart is a consistent measurement. Johnny and Maggie both had growth spurts in the past 6 weeks. Using the height chart, you determine how much they changed height. Maggie grew 4 cm in 6 weeks and Johnny grew less, just 2 cm in 6 weeks. A validated tool ensures accuracy of its use within one patient (Maggie 6 weeks ago vs. today) and accuracy of its use to measure change across population (in the 6-week time Maggie is growing faster than Johnny). 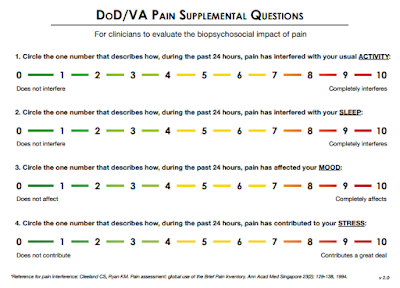 As the current committee chair on the Washington East Asian Medicine Association (WEAMA) L&I Committee, the committee and I strongly recommend Practitioners in the WA State L&I Acupuncture Pilot to use the DVPRS as their pain scale. Does WA L&I Require me to do this? No. 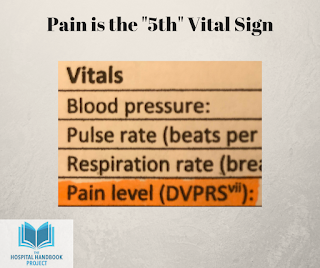 However, “pain level” is the “5th vital sign” and reporting vital signs is an essential documentation point in professional health care practice. Why use this Pain Scale Tool? Pain level is a vital sign. Patients are coming in with a symptom of "pain", you measure pain. Since you are already measuring it, use a validated tool. Using a validated tool in your chart note template makes it consistent for your use and measurement. When all practitioners in a program or clinic use the same tool and are using it in the same way, the tool becomes as consistent as that ruler when measuring change. So, if some day in the future, say 2-5 years from now, your clinic or program does a retrospective data pull, looking at metrics collected in your chart notes, the validated tools you and your colleagues used would be useful data points for measuring change. 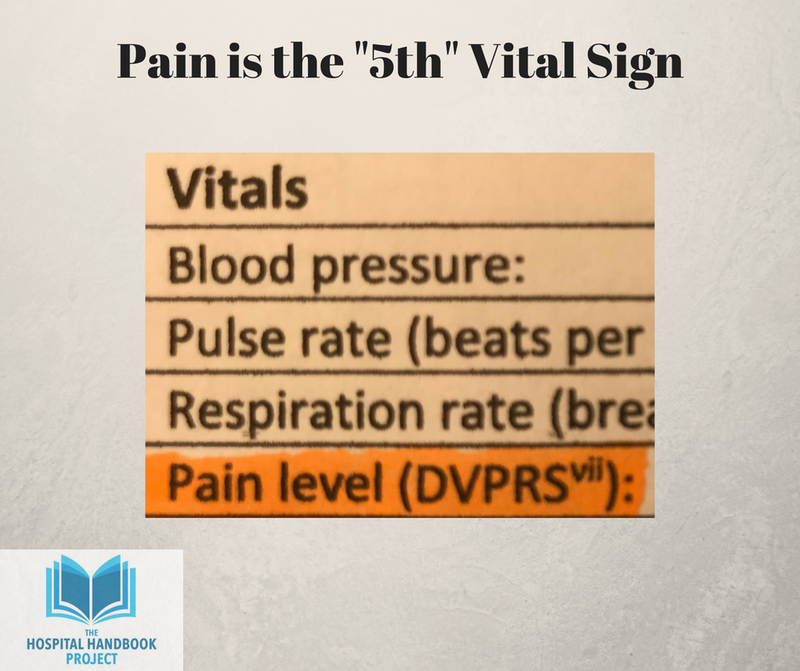 How do I use the DVPRS as my pain scale in clinical work? 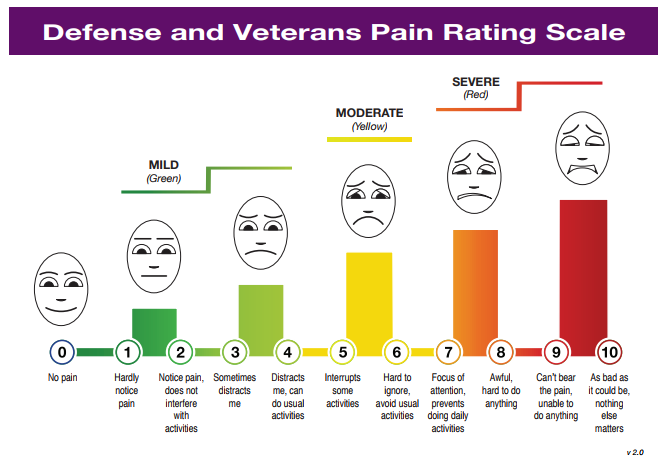 See this 4-minute video overview of what the DVPRS pain scale is and how to use it. When you ask your patient, “How is your pain today?”, have a copy of the DVPRS nearby. You can have a copy of it on your computer or printed and laminated as a visual tool in your treatment room—whichever helps you in your quest to use it consistently with every patient and every treatment. I like to print it in color on paper with the visual scale on one side and the biopsychosocial quick questions on the back side and then laminate the double-sided tool. If you want to print just one side at a time, without instructions, here is the front side and the back side. hand the DVPRS visual tool to your patient to review and give you a descriptive answer. The back side, the 4 questions (activity, sleep, mood, and stress) are there to prompt the practitioner to ask how the pain affects those aspects of life. Why use both DVPRS and MEQ as metrics when you treat a Chronic Pain Condition? Disability questionnaires (like the ODI) and chronic pain scales (like a GCPS) can be challenged [by researchers, policy-makers, program directors, program-funders] as influenced by patient perception or by practitioner bias. Bias or perception can be mitigated, however, when you have a another tool (DVPRS pain scale) that can be compared to them. For example, you have treated Ann who has mechanical low back pain with a course of acupuncture at 2 tx/week for 8 weeks and you measured, at specific points in treatment (initial, mid-tx re-evaluation, and discharge/re-evaluation), not just her pain level (DVPRS), but also her MEQ (during medication review), range of motion of the low back, and a functional questionnaire (ODI). At initial visit, her pain level was 8/10, MEQ was 70, ODI was 85% and she was not able to work due to the pain. At the discharge visit, her pain level was 3/10 with no flare-ups for past 2 weeks, MEQ is 0, ROM has improved 30%, and ODI is 20% and she will be starting work tomorrow. Because of this combination, she is already going back to full-time work, the same type of work, the same job, and able to operate machinery again. So, because you used this combination of metrics, you are able to demonstrate to both the referring provider (or program director, department head, etc) that your clinical work has been clinically significant (30% or greater change in numbers) and it has been cost-effective. This patient, who is returning to her same job with no restrictions and good functional recovery, now has no or minimal long-term disability risks. Review: Using this combination of metrics, DVPRS + MEQ, is essential to be able to measure-ably demonstrate your patient care is clinically significant and cost-effective. Thank you to Dr. Fujio McPherson and Dr. Lisa Taylor-Swanson for their help and support on this article. Want to learn more about how to use this Pain Scale as a metric in your clinic's patient outcome measures toolkit? Take our new mini-course, "How to use a validated pain scale in your Chart note". 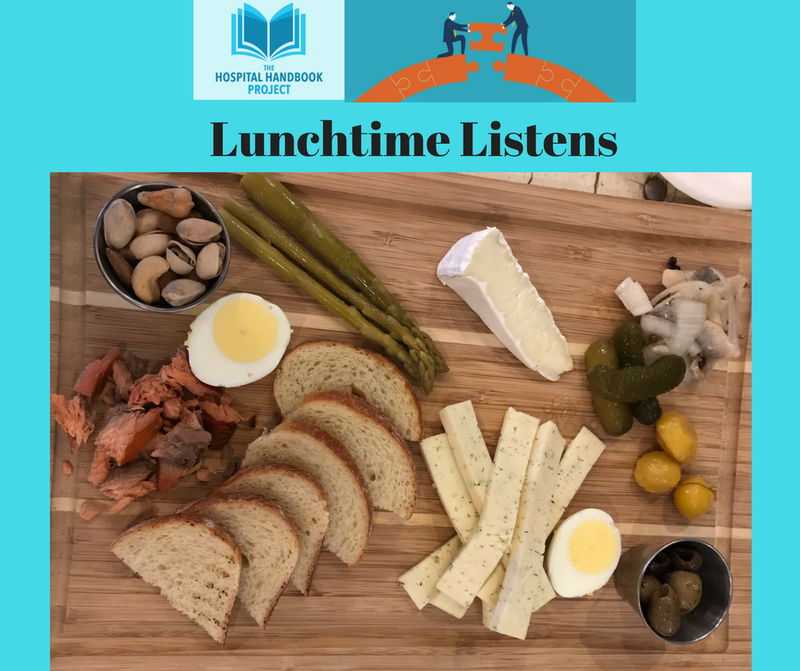 It contains this post as a download-able pdf, some simple templates you may use for recording this tool in your chart note, as well as videos that walk you through how to use it, and information to dive deeper into related resources. 100% of the proceeds from this course go towards supporting the Hospital-practice Handbook Project. Take the course and build the project with us! A 4-minute video overview of what the DVPRS pain scale is and how to use it. An 8-minute video overview of the history behind the DVPRS and why to use it. 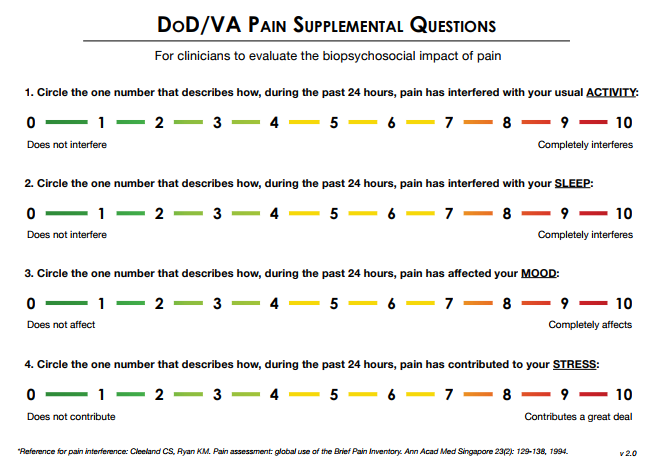 The DVPRS tool to download or print, front side and back side, the biopsychosocial questions. I am interested in learning more! Sign me up for the new online self-paced short course! If you have found this blogpost useful, please contribute $5 directly via the website or take the related mini-course to support this resource. This week's Lunchtime Listen recommendation is John Weeks' presentation from May 17th, 2017, on "Evolving Economics of Integrative Medicine". The webinar was hosted by the Leadership Program in Integrative Healthcare at Duke University. In the "Evolving Economics of Integrative Medicine" webinar presentation, John Weeks presents the historical perspective of integrative medicine and the economics of health care within the U.S. health care delivery system. In case your lunch break is 30 minutes and not 50+ minutes, I included my notes below with minute marks about some of the subjects. Discusses how the idea of CAM’s ability to reduce health care costs has some unexpected negatives in the health care delivery system. U.S.’s current for-profit business model for health insurance actually has the perverse or negative incentive of “containing costs” and not wanting costs of providing healthcare to decrease. This discussion with slides starts at minute 20. For more on this, see related discussion in his article, "The 80/20 Rule: Why Medical Insurers are Not Interested in Cost Cutting (or Integrative Health)"
Minute 34-36: The economic value argument. Samueli Institute and Wayne Jonas, MD and their case for Integrative Health models as good for business and economic health. There is cost savings in nurse retention, the diminished patient length of stay, ability to "make beds available", patient satisfaction and employee satisfaction, and improved safety through reduced errors. Minute 36: the Rise of “Value-Based Medicine”. The movement from Triple AIM to Quadruple AIM. If you found this information helpful, please consider contributing at our website to help with creating this blog resource and building new resources for the community. Thank you.